I love that all of my girls love to read and not only that, it's really great that like their mum, they have a real diverse taste in books. Willing to read both fiction and non-fiction and really learn something new every time they pick up a new book. 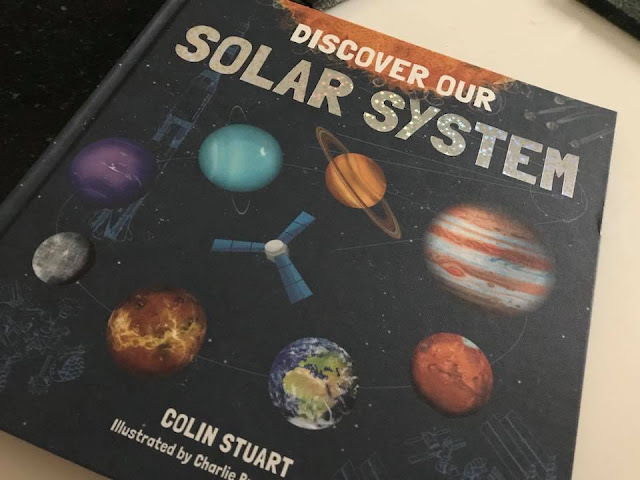 Near the end of last year I was kindly sent a book with a difference, Discover Our Solar System by Colin Stuart. 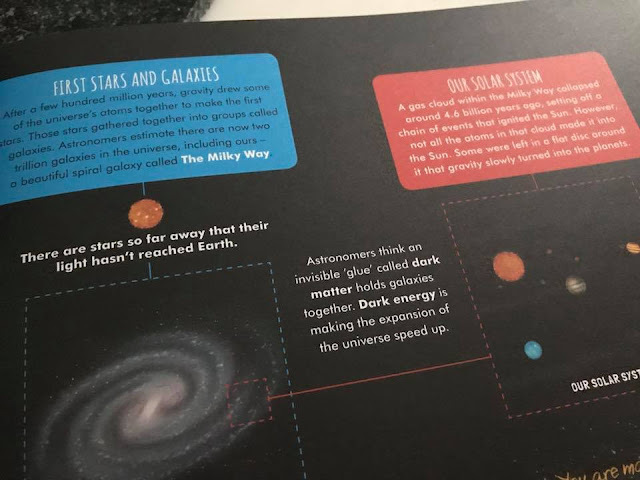 This is a book that is child-friendly (and adult friendly too), giving a great introduction to the solar system with a great mixture of bite sized facts and fascinating illustrations thanks to Charlie Brandon-King. Sit back, buckle up and get ready to enjoy a cosmic tour of our awe-inspiring solar system! Inside this illustrated guide you'll discover the incredible things that make up the solar system and how it came into existence. While you marvel at the beauty of the planets and our Sun and Moon, you can learn astonishing facts about them. You'll find exactly what dwarf planets are, and the differences between asteroids, comets, meteors, meteoroids and meteorites. Plus you can delve into the fascinating history of space travel and glimpse what the future may hold. Colin Stuart is an astronomy speaker and he's written many popular science articles. His astounding knowledge really shows in this book. The front cover itself is immediately inviting to young children. With the mix of colourful planets, cleverly sketched drawings that make up the background and metallic writing with sparkly stars included, you immediately want to open it up and see what's inside. When you find the contents page you discover that it's broken down into smaller subheadings, meaning you can skip pages and go to what you find most interesting first and each of these will then encourage you to delve further into the pages to learn more details about our solar system hides up there. Each section is roughly two pages long. Spread out evenly, there are brightly colour boxes filled with information, the question is which box will capture your attention first. Also included are timelines, what I'd describe as flow charts all broken up with out of this world pictures and differing fonts. No two pages are the same so there is literally something new to be found every time you decide to pick up this book. And it isn't just about the planets. There are various dates, events, experiments and some famous faces that make an appearance in this book, one being Isaac Newton. It's truly phenomenal to know just when certain things were discovered and how they were found too. 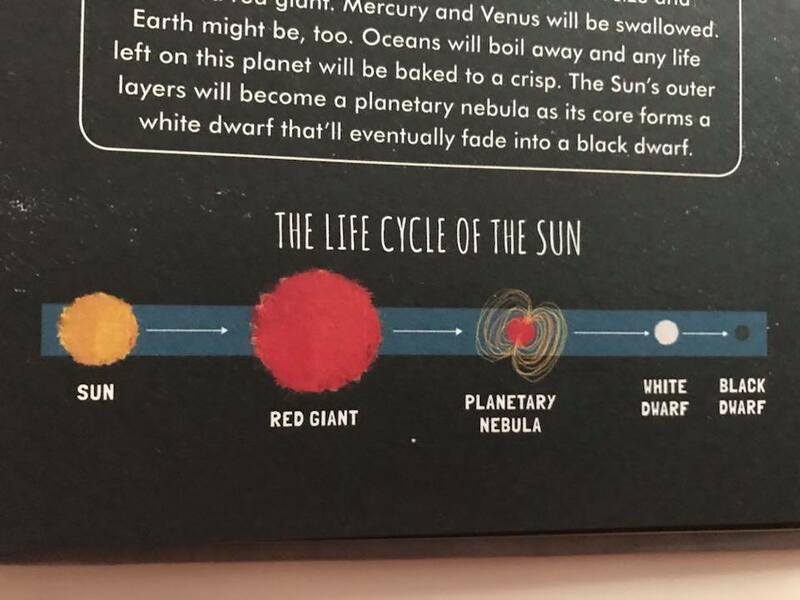 Discover Our Solar System isn't just a one read book. A great introduction for children but brilliant for adults too. It would be a great tool if the subject were being learnt in school! This is a book that you can keep going back to, it really takes you on a complete journey and leaves you in complete awe of the things that we can't see around us. Oh wow! That looks like a great book and I could certainly learn a thing or two from it! This looks absolutely fascinating. I wanted to be an astronomer when I was in primary school, a book like this would have been the perfect gift for me!! Space is endlessly fascinating to children (and adults too) and this sounds like a really good read with everything they need to know. I quite fancy a look myself!